Whether he is "our generation's Peter Sellers", as his friend and admirer Madonna put it, or merely a very gifted character comedian, there is no doubt that Sacha Baron Cohen has, through his alter ego Ali G, become one of the most famous and admired comedy actors of today. He was born on 13th October 1971 in London, and attended Haberdasher's Aske's School, where he was a near-contemporary of the Little Britain star Matt Lucas . After reading History at Cambridge, he discovered that his niche was in comedy, and made his debut appearance in the Jack Dee and Jeremy Hardy show Jack and Jeremy's Police 4 (Channel 4, 1995). 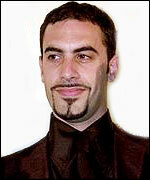 However, his rise to fame was precisely linked with his creation of Ali G on The 11 O'Clock Show (Channel 4, 1998), where he would interview unsuspecting public figures in the guise of a streetwise (although not that streetwise), ethnically challenged young man, given to malapropisms along the lines of asking the former BBFC director James Ferman why he wished to ban A Chocolate Orange. Although the series was not generally held to be a success, Baron Cohen won a British Comedy Award for Best Newcomer, and was given his own series, Da Ali G Show (Channel 4, 2000). This was a witty and surprisingly durable extension of the character, moving beyond straightforward skits to encompass some very clever social satire, especially in the figure of Borat, a clueless and offensive Kazakhstani reporter. It deservedly won BAFTAs for Baron Cohen and for Best Comedy, and led to the character making an appearance in Madonna's video for her single 'Music'. While the spin-off feature film, Ali G Indahouse (d. Mark Mylod, 2002) suffered from uninspired jokes and a lack of focus, Baron Cohen's decision to move Ali G and Borat to America in Ali G In Da Usaiii (HBO/ Channel 4, 2003) led to a freshness and originality that might have been lost from a subsequent British series. His American success has led to greater exposure, both in the form of cameos in series such as Curb Your Enthusiasm (HBO, 2005) and a vocal part in the cartoon Madagascar (US, 2005). His performance in the Will Ferrell comedy Talldega Nights: The Ballad of Ricky Bobby (US, 2006) can only raise his international profile, and hopefully allow the Sellers comparison to be given serious consideration.